20mm x 28mm x 6.6mm stainless steel case, solid back, onyx cabochon crown, steel bezel, black lacquered dial, high-precision quartz movement with hours, minutes, steel chain bracelet, buckle in steel. Water resistant to 30 meters. 20mm x 28mm x 6.6mm stainless steel case, solid back, onyx cabochon crown, steel bezel, white mother-of-pearl dial, high-precision quartz movement with hours, minutes, steel chain bracelet, buckle in steel. Water resistant to 30 meters. 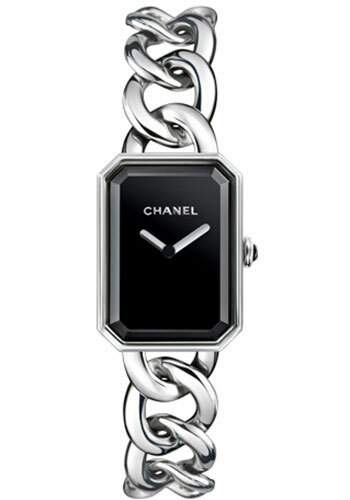 20mm x 28mm x 6.6mm stainless steel case, solid back, onyx cabochon crown, steel bezel set with 56 brilliant-cut diamonds (~ 0.43 carats), black lacquered dial, high-precision quartz movement with hours, minutes, steel chain bracelet, buckle in steel. Water resistant to 30 meters. 20mm x 28mm x 6.6mm stainless steel case, solid back, onyx cabochon crown, steel bezel set with 56 brilliant-cut diamonds (~ 0.43 carats), white mother-of-pearl dial, high-precision quartz movement with hours, minutes, steel chain bracelet, buckle in steel. Water resistant to 30 meters. 20 mm x 28 mm steel case, 6.6 mm thick, onyx cabochon crown, steel bezel, black lacquered dial, quartz movement, steel bracelet. Water resistant to 30 meters.